The Museum of SuperNatural History™: Yet Even More Yeti Evidence; Expert Enquires: Who Fakes Footprints At 19,000 Feet? 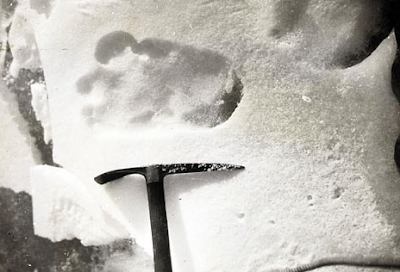 Yet Even More Yeti Evidence; Expert Enquires: Who Fakes Footprints At 19,000 Feet? Just to put it into perspective, 19,000 feet is roughly the altitude which mountaineers refer ominously and appropriately to as “The Death Zone” - since the amount of oxygen in the air can no longer sustain human life. Attenborough’s implication is that it is highly unlikely that anyone would have the means or the wherewithal to attempt to perpetrate a hoax at such dizzying Himalayan-heights. In addition to all of the compelling footprints that have been filmed and photographed over the years is another profound piece of evidence - hair samples discovered in the summer of 2008 near the Indian-Bangladeshi border. To date, tests performed on the thick, wiry hairs have determined that they do not belong to any of the indigenous creatures known to inhabit these cryptozoological climes. Fun facts: the term “Yeti” is derived from the Tibetan language and means “rock bear.” While the first authoritative description of the creature was made in 1889 by the British explorer Major L A Waddel, it wasn’t until 1921 - during a Royal Geographical Society Everest expedition that found footprints made by “a wild man of the snows” at 21,000 feet - that the term “Abominable Snowman” was dubbed. Likewise, over the years, a variety of luminaries have also argued for the existence of the Abominable Snowman. Sir Edmund Hillary, the first man to summit Everest, led an expedition to find the Yeti in 1962, and famed Hollywood-everyman Jimmy Stewart has long been rumored to have smuggled remains of the creature out of India in what has become known as the Pangboche Yeti hand incident of 1959.